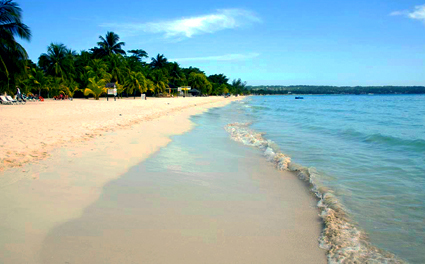 The Government of Jamaica has responded to the call of residents and tourism stakeholders in Negril for increased measures to protect the area’s world famous beaches. Approximately 2,500 metres of the Negril shoreline is to be rehabilitated under Jamaica’s Adaptation Fund Programme launched last week in Kingston. The initiative, which is being implemented through approximately $902 million (US$9.965 million) in grants from the Adaption Fund, will focus on protecting coastal areas and agriculture. A total of $489 million (US$5.4 million) of the amount is to be spent to restore and protect the coastline in the tourism mecca, which has being eroding over the years, posing a threat to the tourism industry and the livelihood of those, who depend on the sector. Chief Executive Officer of the National Environmental Planning Agency (NEPA), Peter Knight, welcomed the focus on Negril. He said that although many developments within the tourist area were originally within the minimum 100 metres setback from the coastline, increased coastal activities over the last 40 years, some relating to climate change, have resulted in a net loss of 30 meters of beach sand, with some establishments now virtually in the sea. The loss was accelerated in the last 10 years, he said, by five hurricanes that hit the resort town and further exacerbated by dying seagrass beds and pollution from the upper watersheds, particularly from sewage. NEPA will be partnering with the National Works Agency (NWA) to enhance the resilience of the Negril coastline through Component 1 of the Adaptation Fund project. Already, NEPA is implementing “soft engineering measures” to secure coastal ecosystems, such as the beaches, sand dunes, sea grasses, mangroves and coral reefs, with the assistance of a European Union/United Nations Environment Programme (UNEP) grant. The US$5.4 million from the Adaptation Fund will boost the resilience efforts, providing for the installation of breakwaters, which are hard engineering structures. “These breakwaters will increase the resilience of a weakened section of the coral reefs within the Negril area, and will minimize the impact of waves on the coastline. This will therefore assist with protecting the soft engineering work currently being undertaken, and hopefully, result in a net growth of the beach,” Mr. Knight explained. He noted too that as part of the holistic approach, NEPA will partner with the Ministry of Tourism to implement a public education campaign, which will educate the community on their vulnerability to natural hazards and prepare them for mitigation against coastal disasters. Focus will also be placed on developing guidelines/technical standards for beach restoration and shoreline protection; and adaptation plans for the most vulnerable areas along the Negril coastline. Mr. Knight strongly believes that stakeholders of the resort town should contribute towards the improvement effort.